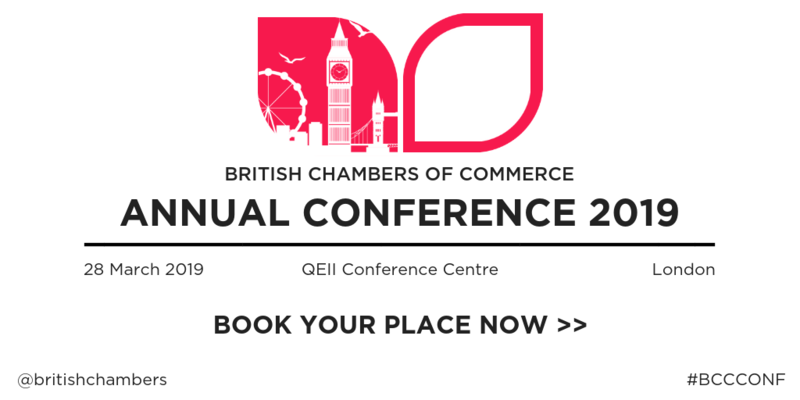 Join a high-level audience of business decision-makers, policy makers and the Chamber network on Thursday 28th March at the QEII Centre in London, for the British Chambers of Commerce Annual Conference. As Britain’s biggest and best ‘B2P’ – business to politicians – event, the BCC Annual Conference is an exceptional opportunity for Chamber staff and members to keep up-to-date with the latest issues affecting British business, as well as network with other businesses and Chambers from across the UK. Further speakers will be announced in the coming weeks including high profile politicians and commentators from the world of business and media. See our website for more details of the event programme and speakers. Book your tickets before 15th February 2019 for our early bird Chamber rate of £129 + VAT.